Whether you need an introduction to Korean food, or a reason to fall in love with that cuisine again, Hanok delivers, dishing out satisfying Korean favorites in a homey setting. The restaurant Hanok in Madison Park takes its name from the Korean word meaning a traditional house, but also from the blended names of its husband-and-wife proprietors, Han Kim and Jade Ok. The double entendre is apt for this modest neighborhood restaurant. Hanok feels very personal: a cozy house that seems like home, with Ok in the kitchen and Kim out front, acting as both host and server, always ready with a smile. Korean specialties share the bill of fare with some Japanese-inspired dishes: stir-fries, udon soups, sukiyaki, teriyaki and katsu chicken and pork. For those new to Korean food, Hanok offers an entry-level introduction. Kim beamed when we ordered ghimmari, one of his favorites, and ddukbokki, one of his wife’s favorites, he said. Ghimmari are thumb-size bundles of nori-wrapped yam noodles, battered and deep-fried. The satisfying little bites taste salty, savory, crisp and yielding all at once. Ddukbokki is a more substantial plate. Long, cylindrical rice cakes and springy, round fish cakes loll in a red sauce that’s sweet but assertively spiked with gochujang, the fermented chili-pepper paste, and deepened by a broth typically made using anchovy and kelp. 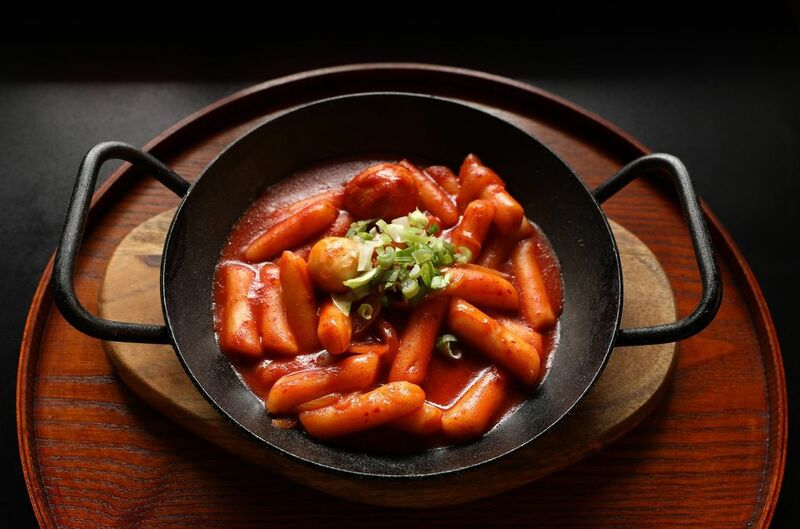 Ghimmari and ddukbokki are considered “bunsik,” inexpensive dishes usually sold in Korean snack restaurants or as street food. Other appetizers would fall into that category, too, such as the dainty, pan-fried pork dumplings (mandoo) and crisp, golden “veggie croquettes,” essentially panko-breaded mashed-potato patties that taste like a refined version of McDonald’s hash browns, served with katsu sauce. A bunsik combo is typical Korean date-night food, say Ok and Kim. Both were born in Korea, though they did their dating here. Kim’s family emigrated when he was a youngster. Ok arrived here at 19 with a zeal for cooking that led to the dream of opening a restaurant, long-nurtured while she and Kim raised two daughters. Her culinary education began at her mother’s side, learning family recipes. She’s adapted those and expanded her repertoire by observing chefs at Seattle restaurants like I Love Sushi, where she worked the front of the house, and by cooking alongside women of many generations at her church. Among entrees, soondooboo, a tofu stew, and dolsot bibimbap, a hot rice bowl, stand out. 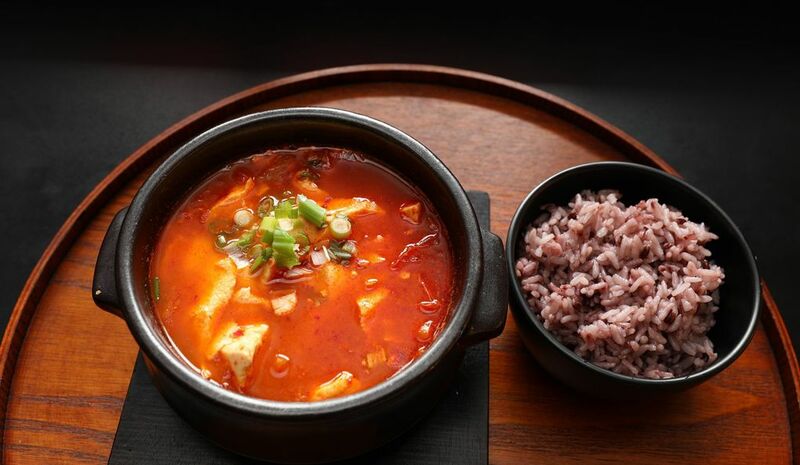 Soondooboo harbors incredibly silky tofu afloat in a bright red gochujang-fired broth that kindles a gentle but persistent burn. 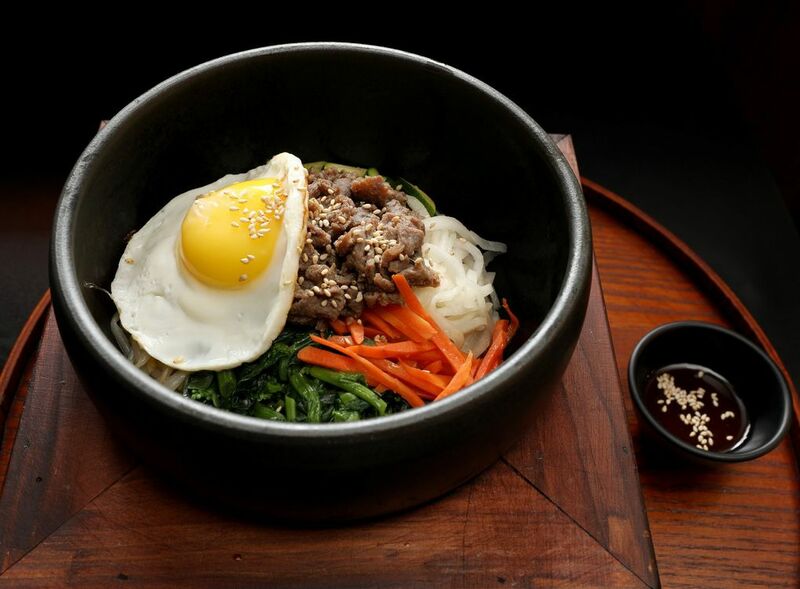 Dolsot bibimbap comes in a hot stone bowl. Purple rice (a mix of black and white rice) sizzles in the bottom of the bowl getting crispier the longer it sits. Atop the rice are an array of vegetables and your choice of protein (beef is traditional) capped with a fried egg, all of it meant to be jumbled with the pungent bibimbap sauce that comes on the side. Galbitang, a soup made with beef ribs and very thin vermicelli noodles, came with a meaty bone protruding from the steaming bowl of clear broth. A little longer in the pot might have made the meat more pliant, easier to finagle off the bone with chopsticks, but once I did, it was delicious. Radish and ginger permeated the mild broth, but I thought it needed more kick. If there is not a little pot of chili paste on the side, ask for it, and stir some in. Ok uses good quality meat and seafood. Grilled galbi short ribs were tender and supple. Slices of grilled pork belly (samgyupsal) were overcooked but well-seasoned with gireumjang, a salt, pepper and sesame-oil emulsion. Both meats were served in hot skillets on a bed of onions that I wish had been more caramelized. Traditionally, Korean meals include banchan, many small, complimentary accompaniments. 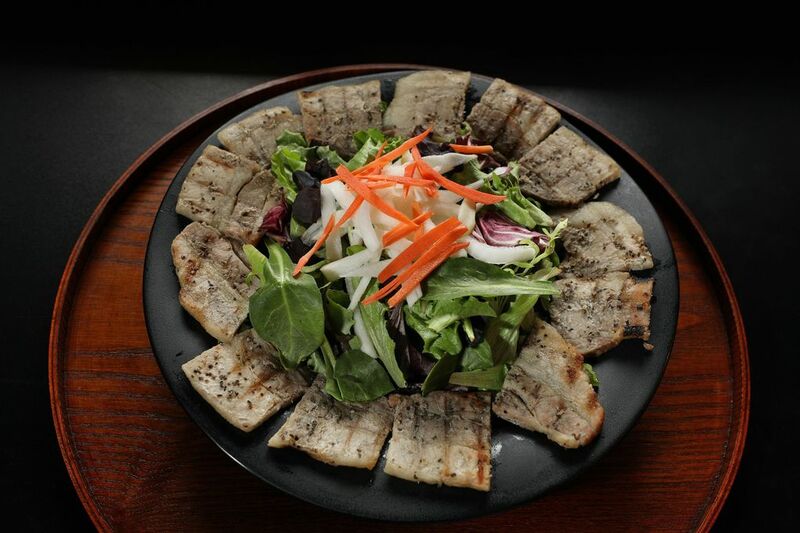 Here the entree price usually includes miso soup, a mixed green salad tossed with miso vinaigrette and a bowl of purple rice. If you add an order of the vibrant, house-made kimchi trio (daikon, cabbage and cucumber) to your meal — worth an extra five dollars and you should — it approximates banchan. Among the non-Korean dishes, I enjoyed a light, mildly spicy seafood stir-fry that contained a modest amount of shrimp, squid and tiny bay scallops, and an abundance of bright, fresh vegetables. Stir-fried udon noodles eschew chili heat altogether, but the combination of firm-to-the-bite noodles, crisp vegetables and sweet, charred chicken was no less winning. Ok could improve her pancake game. Savory appetizer pancakes (juhn) were a little heavy and oily. Sweet dessert pancakes (hotteok), made from yeast dough, fell flat. Kim sometimes gets forgetful when the 30-seat dining room is full, though he never appears flustered. He’s still learning the restaurant ropes. An engineer by training, he’d never waited tables before they opened Hanok last October. With its wide-ranging menu, warm hospitality and moderate prices, Hanok is already attracting families for Saturday lunch, and yes, date-night couples. The customer demographics on my visits were as diverse in age as in ethnicity, unexpected in Madison Park. At dinner one night, I struck up a conversation with a silver-haired pair who said they’d also been in for lunch that day. With that kind of loyalty from the locals, Hanok appears destined for success.